When it arrived on the market the VC10 had a serious battle on its hand to compete against other four engined airliner designs then available. Although not exactly 'competition' one aircraft that is often compared to the VC10 is the Ilyushin-62. The obvious reason is the striking similarity in the two designs and many will say that this is proof of spies who stole the plans from Vickers' desks and brought them to the Soviet side. The article below was written by Peter Skipp (a self proclaimed VC10 fan) in an attempt to get the facts straight on this once and for all. Whenever the VC10 is mentioned, the Ilyushin-62 tends to make a co-appearance in the demeaning role of a copy. Yet, the Il-62 is no VC10 copy, but a fascinating aeroplane whose story deserves to be better known. Vickers had honed the VC10 since the cancellation of the VC7/V1000 in 1955. As it became clear that BOAC would buy Boeing 707s for trans-oceanic routes, George Edwards aimed his design at their Medium-Range Empire routes to countries with undeveloped hot and high airports. Alongside this, he also had in mind the RAF’s need for a personnel/freight transport, again to ‘up-country’ destinations. Though in time the Super VC10 did come to fly the North Atlantic, its progenitor was never intended as a true long-ranger, nor was it ever a pure civilian machine. In contrast, the Il-62 was always intended as a purely long-range machine, and one entirely devoted to passenger service. Ilyushin conceived the idea of it in 1960. At the time, the Tu-114 was suffering service-entry delays. It was also becoming clear that, however fast, the turboprop would not be competitive with the Boeing 707 and Douglas DC-8. It was these two Western designs that Ilyushin had in his sights—not the VC10. In the early 60s USSR, the ‘VC10’ role was played by the Il-18 and An-10; later, it would be played by the Tu-154. Though late, the Tu-114 did enter service in 1961, affording the Il-62 a leisurely development pace. Other delays were caused by late delivery of flight-rated NK-8 turbofans (the prototype flew with puny Lyulka turbojets) and somewhat protracted aerodynamic development. The Il-62’s configuration was largely decided for Ilyushin by the Central Aero and Hydro Dynamics Institute—Soviet equivalent of much of NASA, and of the Royal Aircraft Establishment. 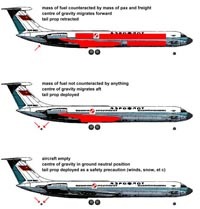 At the time, TsAGI was in thrall to the aft-engined T-tailed layout, which explains why the USSR had an unbroken airliner generation featuring it (Il-62, Tu-134, Yak-40, Tu-154, and Yak-42). At this stage that Ilyushin may have wished he knew the VC10’s secrets, but more to the point, at the very same time George Edwards would very badly have wished he knew Ilyushin’s secrets! As we know, the VC10 also underwent protracted aerodynamic tribulations which never did reach the clear-cut closure of the Il-62. Both types had their engines’ thrust lines canted from the horizontal. Both had extensive leading edge modifications. However, while the Il-62’s layout was fixed at the prototype stage, each successive customer model of the VC10/Super VC10 featured different leading edge and wing fence layouts. Indeed, VC10s for BUA and Ghana Airways feature drooped wingtips which look very similar to the Il-62’s fixed droop, and which perform in a very similar manner at high altitude and speed. VC10 design studies also looked at wingtip tanks which would undoubtedly have had aerodynamic and/or trim/ benefits. By comparison with this prolonged probing by Vickers, Ilyushin froze the Il-62’s wing in 1967 and it remained unchanged ever since. The above pours cold water on claims that Soviet spies had an input in Ilyushin’s design process. Yet, the conclusive proof that Moscow was ahead of Weybridge technology has been visible to all ever since the Il-62 made its world debut at Paris in 1965. It is the tail prop. The ungainly tail prop has taken much stick over the decades. The accepted view is that it is evidence of poor mathematics on the part of Ilyushin. Nothing could be further from the truth. But what, then, is its function? Ilyushin was all too well aware that TsAGI’s pet aft-engined T-tailed layout imposed terrible penalties on his Il-62. In particular, he knew that the tail moment arm was shorter, calling for a larger and heavier tailplane. So he decided to cheat a little. He moved the wing slightly ahead of its ‘classical’ position at the aircraft centre of gravity, correspondingly lengthening the tail moment arm. However, this left the landing gear in front of the aeroplane’s centre of gravity. The tail prop fixes this. It has a pair of castoring wheels, enabling it to be used while taxiing. 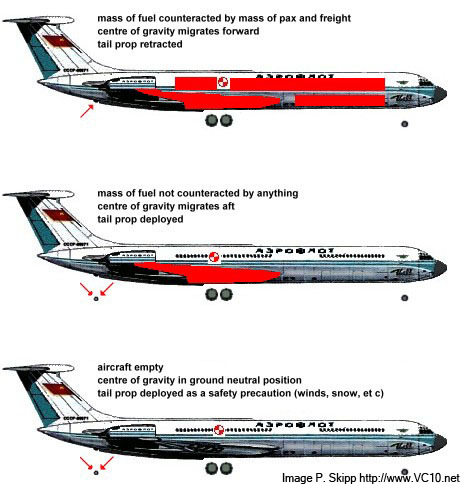 In practice, when the Il-62 is loaded for a flight, the weight of passengers and luggage counterbalances that of the fuel in its swept wing, and the tail prop is retracted. Well, the benefits of the tail prop are nothing short of immense. The Il-62, an aeroplane larger than the Super VC10, has a tailplane which is only two thirds as large as that of its British look-alike. And while the VC10/Super VC10 needs no fewer than 17 hydraulic actuators in their tailplanes, the Il-62 has exactly none! Its flight controls are entirely human muscle-powered! So far, we have learned that the VC10 was an ‘up-country’ medium range airlift/airliner compared with the Il-62 -- a long range pure airliner. But there were numerous other differences between the two types. The VC10 was a technological tour de force. Much of its structure was famously milled from solid billets of metal. Its flight controls were at the leading edge of hydraulic and aerodynamic design in its time. Its cockpit technology was ahead of the prevailing 1960s state of the art. In contrast, the Il-62 is entirely an ‘appropriate technology’ design. It employed proven production techniques, with no technical breakthroughs in any notable area. Its flight controls are practically ‘village level,’ in that any aircraft technician could rig them up with hand tools available away from base. Its cockpit needed five crew members, named Ship’s Commander, Second Pilot, On-Board Mechanic, Navigator, and Radio Operator in Soviet parlance. Seen here at Schiphol in 1998 the tail prop on this Aeroflot Il-62M is obvious. In the background is Heavylift's Belfast which was a frequent visitor in those days. By now, we can see that despite their strong superficial similarity, on examination the VC10 and Il-62 are indeed rather disparate animals. The Soviet design is clearly the more competent of the two, and this comes across in the story of its employment and the lack of any need for dramatic improvements. By service entry in 1967, Ilyushin had largely 'nailed' the Il-62. The one area which needed improvement was fuel efficiency. This mattered not because of any ‘green’ concerns (these were very far indeed from the Soviet agenda), but because of the benefits greater range would bring to its ‘master client,’ the Soviet ‘monoairline’ Aeroflot. By the early 70s, the Il-62 was fitted with the promising new Solovyov D-30 turbofans, which had greater rated thrust and a more than doubled bypass ratio compared with the original NK-8s. They were also much quieter. A problem associated with the new engines was their larger frontal area which negated much of the benefits. Accordingly, Ilyushin put the Il-62 through a subtle aerodynamic slimming programme. This addressed the tailplane/fin bullet in particular. The resulting Il-62M was the last development of the Il-62. This paucity of further works testifies to the lack of any need for further attention. Ilyushin had ‘nailed’ the Il-62 just where he had wanted it to be! By contrast, the VC10 endured much, and substantial, development. Yet, the one area where it needed most attention—fuel consumption and noise—was never addressed in the radical and successful manner of the Il-62. Even today, the VC10 tankers in RAF service use Conways that were outdated, thirsty and noisy at service entry in 1964! Apart from Aeroflot, the Il-62 saw service with a large number of Soviet client state airlines. Its exports began with CSA in 1969 and continued with Interflug, Zhongguo minhang zongju (“CAAC”), Lot, Tarom, Cubana, Chosonminhang, and Hang khong Viet Nam. Aircraft have been wet-leased to Air-India, Aeronica, MALÉV and others. The Il-62 base model stayed in production until 1979, and the Il-62M is incredibly still ‘in production,’ albeit on a drip-feed principle, to make up for attrition. 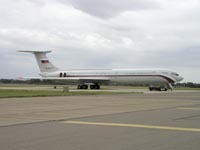 One Il-62 has been photographed in Russian VVS markings, but no other military operators are known, and the VVS uses it as a staff transport. The Russian Ministry of Natural Emergencies also used a single Il-62 which it lost in a crash at Lisbon. Rather like the DC-10, the Il-62 suffered spectacular crashes which brought it the reputation of a jinxed airliner. The first major crash was near Moscow in 1973, when all on board perished after a contagious engine failure. This scenario was repeated in East Germany the following year and no less than twice in Poland when fully laden Lot machines suffered contagious engine failures, killing all on board. As a proportion of the small number built, the VC10 also had a fair share of crashes, but none had the gruesome proportions of Il-62 accidents. On the contrary, when in circumstances that would be considered fatal for any other type, the British type showed a toughness and survivability that earned it a just reputation for safety. While the Soviet Union nurtured and developed its Il-62, Britain acted like a hostile step-mother to its VC10. Inevitably, this brings up ‘what if’ questions. What if Vickers had somehow accessed the Il-62’s tail prop know-how? Surely, that would have made the VC10 more attractive to a greater range of potential operators, particularly those from the Commonwealth? What if Rolls-Royce had developed the Conway with a new front fan? Surely, that would have pulled the rug from under the feet of objectors who pointed to the British design’s fuel profligacy? What if the VC10 had stayed on in production? Surely, at the very least Minhang would have bought it? Your author is sceptical. Though darkly, the captains of British industry in the 1960s did glimpse a future in which Britain divested of its manufacturing to specialise in very few extremely high-tech industries. Aero engines are one such industry, and the RB.211 then on the drawing boards has proved a good bet for Britain. The VC10 would have been jettisoned even if it had been marginally more successful. Indeed, despite the careful husbandry and sponsorship of indigenous talent, Russia today, and for the past 15 years, had and has practically useless civil airframe and aero engine industries. 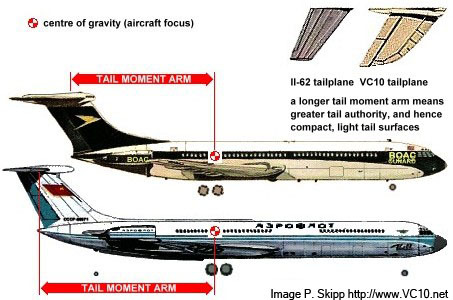 The Il-62 is portrayed as the bad guy whenever the VC10 is mentioned, yet even superficial analysis absolves it of any copycat accusations. It is a distinct aeroplane with a fascinating history. Indeed, compared with the VC10, it comes across as technically more accomplished in many ways. Rather than resenting it, VC10 fans should enjoy its passing years. Certainly, the sight of four engines beneath a T-tail stirs glad and sad memories in your author’s breast. The Il-62 (one should say either “Il-62” or “Ilyushin-62”, and never the tautological “Ilyushin Il-62”) emerged from amid a highly individual system. Design offices like those we call “Antonov,” “Ilyushin,” or “Tupolev” were not owned by Messrs Antonov, Ilyushin, or Tupolev. They were part of the Ministry of the Aviation Industry (“Minaviaprom” or MAP) and their proper names were abbreviations like “OKB-240” (in the case of Ilyushin). The initials were there as an informal recognition of the founders. These OKBs (Russian abbreviation of “Opytno-konstruktorskoe buro”—“Experimental and Design Bureaux” or, if you like, “R&D Offices”) were relatively small. They did not conduct fundamental research or configuration studies. That was the job of TsAGI (op. cit.). The offices simply tailored ready-made solutions to specific products commissioned from them. In addition, they did not have any views on the market (and if they did, nobody would care). There was no place for a market in the Soviet system. Consumers—from Aeroflot to the man on the collective farm—had to live with what the state offered. The offices did not own the factories that built their designs. They were property of another MAP department. One factory often built designs from more than one office. Neither did the offices sell their creations. Within the USSR, change of title did not entail a transaction. (At the factories, aeroplanes were simply handed over to Aeroflot with no financial considerations; Soviet aircraft were offered for export by a MAP division called V/O Aviaaeksport.) Neither did the offices service their aeroplanes. That was the job of Aviaremont—a MAP branch that owned the various repair facilities. In short, the Soviet aircraft design offices did not act like Boeing or Airbus, but like naval architects that designed aeroplanes instead of ships.